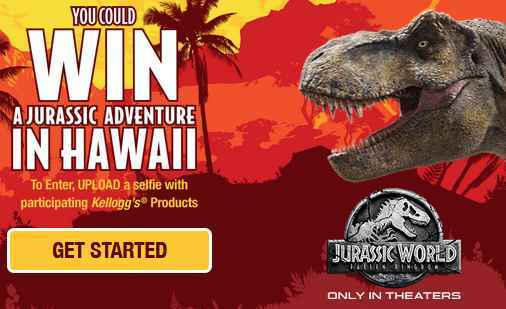 Enter the Kellogg Jurassic Adventure Sweepstakes now by visiting their website at https://www.kelloggjurassicadventure.com and then follow the online instructions to complete the online entry form. After that take your Selfie photo along with one of their participation products and submit it on their website for your chance to win a trip to the Kualoa Ranch in Hawaii (ARV $9,000 “Grand prize“) and other 25 lucky winners will receive a GoPro Hero 5 Session 4k Action Camera. The Kellogg Jurassic Adventure Sweepstakes begins on April 15, 2018 at 12:00:00 AM Eastern Time (“ET”) until and ends on July 31, 2018 at 11:59:59 PM (ET). Limit of one (1) entry per eligible person, per day, during the sweepstakes period. One (1) Grand Prize–Grand Prize winner will receive a trip for winner and one (1) guest to the Kualoa Ranch in Hawaii (ARV $9,000). Trip includes: round-trip coach air transportation for winner and his/her guest between a major commercial airport closest to the winner’s residence and Honolulu, HI; lodging at the Royal Hawaiian Hotel consisting of one(1) room for four (4) nights (based on double occupancy); a helicopter tour; a movie site tour; a Jurassic jungle tour; ground transportation to/from hotel-movie site/jungle tour; mid-size rental car for five (5) days;and$1,500 spending money (for winner only). Five (25) First Prizes winners– Each First Prize winner will get a GoPro HERO 5 Session™4K Action Camera (ARV $199.99ea.). Total ARV of all prizes$13,999.75.Limit one (1) prize person in the Sweepstakes.